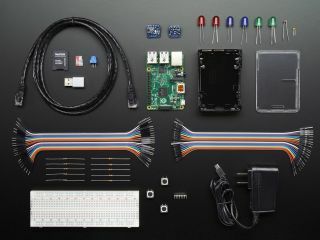 Microsoft and Adafruit have announced the release of the Windows 10 Core Starter Pack for Raspberry Pi 2. It’s for people who want to get started “learning either electronics or Windows 10 IoT Core and the Raspberry Pi 2,” said Steve Teixera on the Windows Blog announcement. The kit comes with a compatible set of sensors, electronic parts, wires and cables that work with Windows 10 IoT Core. It also comes with an SD card with Windows 10 IoT Core on it, as well as some getting started instructions and sample code for projects you can make. A power supply, WiFi module, ethernet cable, breadboard, jumper wires, LEDs, potentiometers, and switches are all included in the pack. There are also different sensors for detecting light, colour, temperature and pressure. There's a lot in there to get you started. "Many Windows developers are coming to Raspberry Pi for the first time," said Helen Lynn, Raspberry Pi social media editor. "We couldn’t be more pleased to welcome them, and we hope they’ll encounter much success and plenty of fun building with Raspberry Pi." The Microsoft IoT pack is currently $115 (including a Pi 2 Model B) on the Adafruit website, or $40 without, but both are currently out of stock. More kits are on the way, though.